The Sandusky SL33017-02 is a welded steel book truck with casters, three single-sided sloped shelves with 12" clearance between each shelf, and a 200 lb. 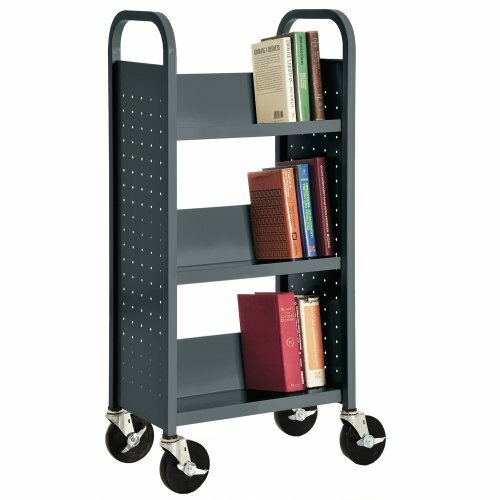 total capacity when the weight is evenly distributed, and is suited for organizing, storing, and transporting books, reference materials, and binders, among others. The frame is made of 18 gauge steel and the shelves are made of 20 gauge steel for strength and to resist denting. The book truck has end panels with U-shaped handles, and two swivel and two fixed 5" casters for control and maneuverability. The book truck has end panels with U-shaped handles, and two swivel and two fixed 5" casters for control and maneuverability. The casters are made of polypropylene to resist high temperatures, corrosion, and wear. This book truck has a powder coat finish to resist chipping and corrosion. It is commonly used to organize, store, and transport books in law offices, schools, and libraries, among others. The unit, with casters, measures 46 x 18 x 14 inches (H x W x D). (H is height, the vertical distance from lowest to highest point; W is width, the horizontal distance from left to right; D is depth, the horizontal distance from front to back.) Some assembly is required, instructions are included, and tools for assembly are sold separately.